The book is now finished and is available in a number of formats (thanks to many kind readers who took the time to make them). There are undoubtedly still typos and mistranslations, so keep commenting (or emailing cosmos @ cadet-nine.org) when you find them and I’ll continue to edit the PDF a couple times a year. Please do not upload these files anywhere else for people to download. This is in case I ever get told I’m violating copyright or whatever and I have to take down the files or the entire site. Here’s a quick FAQ from the questions I’ve seen in the comments. 1. Can I translate the story to X language? Yes, of course! If you want to send me a link, I can add it to the list of other translations on the site. Sending me an email (cosmos @ cadet-nine.org) is faster than leaving a comment. 2. What will you work on next/Will you translate X novel? I’m not currently looking to translate any other novels, but I do know about Shin Sekai Zero-nen. It should be complete at the end of 2018 and if someone uploads the scans I’m open to translating it. 3. Can I post the files to another site? 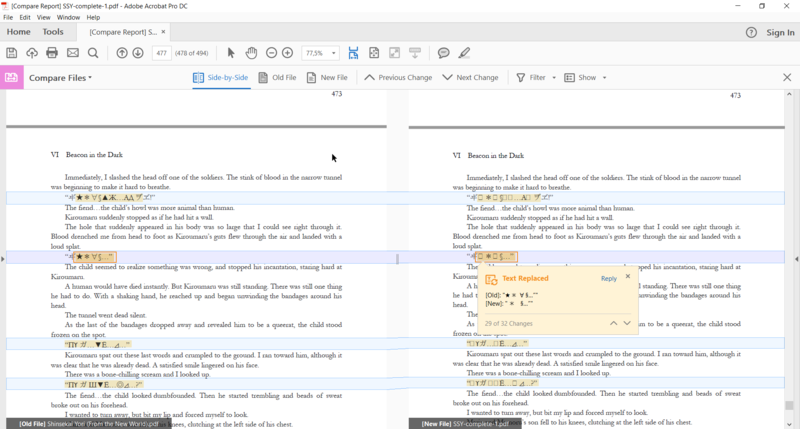 There is always a chance that I’ll be told to take down the translation because of rights violations or something, so I would like to have control of where the files are (also easier to make sure people always get the most recent version). Please don’t upload the files to some other sharing site. I’m really flattered by all the offers I’ve gotten, but I never expected to get any form of payment for this. If you’d like, donate the money to a good cause :) This is a list of reputable organizations. As always, thanks for reading! If you have any pressing questions, you’ll get a faster reply by emailing me (cosmos @ cadet-nine.org) since I don’t check back here regularly. Also, here’s a raw scan of the novel. Hi. I am really sorry (I haven’t uploaded it so I guess I haven’t done something illegal yet). I used your pdf file and made a .epub with TOC, cover, and links. I wonder if you intrested on getting it so that you can upload it or just use it for your own purposes. I assume that you already knew this, but epubs are pretty sweet when it comes to reading novels, books, and texts on iPads, so it would be great if more people could get it. I tried to sync the e-pub to my iBooks on iPhone to read but it doesn’t appear? 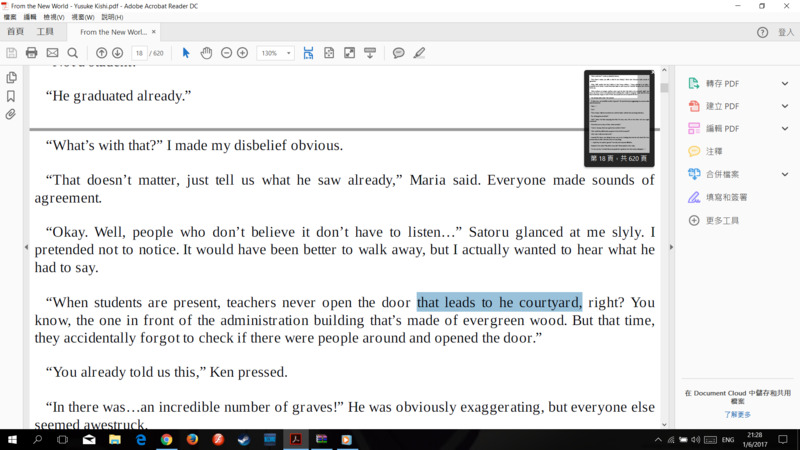 Is there a problem with the e-pub or with my phone? oh no D: I don’t know if I can help with that since I don’t have an iPhone, but dwanex said that they work fine on iPads, so I assume there’s nothing wrong with the epub? Since I believe what works on one should work on the other? Maybe someone else can chime in about this? edit: I dug out my really old half-dead iPhone and gave it a shot. It does work, so I don’t think there’s a problem with the epub. 1. get the file on some other app which can read the file and then open the file in another application. I usually use Dropbox or iFunbox to sync. Hi. I come from Poland and Shin Sekai Yori really charmed me. As i know, many people in my country love this novel as firmly as me and want to read it in their native language so i decided to start translating. Getting straight to the point, i took advantage of your translation. I hope you do not mind it, however, i want to make shure so if you have something against just reply me, and i will deleate it. I have no problem with people using my translation to translate into other languages (: good luck! Thank you so much for doing this! Your hard work is appreciated. On page 96, there is a backwards quotation mark in paragraph 6. On page 131, there is a backwards quotation mark in paragraph 18. On page 142, there is a backwards quotation mark in paragraph 19. On page 155, there is a backwards quotation mark in paragraph 16. On page 166, “nestling” should be a plural “nestlings” in paragraph 17. On page 172, in the second to last paragraph there is a backwards quotation mark. On page 175, there is a backwards quotation mark with improper spacing in paragraph 11. Hi there, I just wanted to thank you. Really. For your time, effort and work. I’d like to say thank you for all your hard work! I’ve been wanting to read this series very badly since the anime came out. I finally got it in Korean but my Korean isn’t the best. It makes me happy that you took the time to translate the series because it helps a lot when I can’t understand certain phrases. Just to let you know I appreciate all your hard work, thank you! Hi. I really love this anime, and I really want to read it when I learned that this anime was based on a book. I’m happy that I found this website. Thank you so much. I have a question though, how many chapters this book have? It has 37 chapters. It’s pretty long though, as the novel has more than 1000 pages altogether. Just wanted to thank you for doing the original novels. I recently finished the anime and it was so good that I thought I’d check out the source material. Wow, what a dream! Thank you so much for your time, effort, and hard work on the translations! It is deeply appreciated. I really thank you so much for making this translation.. I know it’s not easy.. I got really interested in reading the novel after finishing the anime, which was spectacular while there’re points that feels inadequate, & the books are always better than whatever adaptations that were made from them..
Pls keep up a good work, for I’ll be eagerly awaiting new releases.. The true is, I’ve just read the first chapter, and some posts, sometimes…. I’ve watched the anime when It came out in 2012 and I really apreciate the work you’ve done so far. I understand that my words are meaningless, why wouldn’t I write something before? Godness, the time flew in a blink of a eye. At first I tought you would gave up the whole project, but even if you travelled for months, and studied for exams you still have continued translating. I don’t even know if my english is correct, so I’m sorry. I’ll support you, until the end from Italy! Thank you. Sincerely. Thank you very much for your hard work. I´ve just finished the anime and I may say that was incredible. I hope you´ll continue with this and be sure that I´m gonna be supporting you! Sorry if I make any writing mistake. Oh my God, thank you for your work. The anime is one of my favorite and I was so sad I couldn’t read the original novel somewhere. But now I can, thanks to you. Be sure I’ll follow and support your work until the end. Thank you from Belgium and sorry for my english :D.
thank you for this translation. I cheer you up until the end^^. Thank you very much! :D i didnt thought somebody translated it,but you did it! The anime has touched me so much and i really wanted to read the novel. Thank you for all your hard work! This is truly a feat of greatness! I thank you from the bottom of my heart for translating this wonderful novel series. It’s one of the best dystopian fiction novels around and you have brought it to life for your English speaking readers :) I have directed many of my fellow book lovers to your site and we are all cheering you on as you finish this amazing translation achievement! Good work and we all look forward to the finished series! :) :) :) THANK YOU! Thank you for your translations and the pdf ! Thanks again for continuing to work on this! Can you tell me how many part will be else? And when? Thank you so much for keeping this project alive, much appreciated. Thank you for the great work, i wonder if it’s possible to upload this with larger text. Somehow I can’t change size on the epub one. I’m using Aldico for reading ebup and pdf. Thank you so much for this project, I appreciate it greatly that you are willing to translate the novel for the fan community. I hope you get enough credit for the hard work you are doing. Aside from enjoying the story, I’m using your translation as reference to work on my Japanese. I have a few questions: which country are you from? Where did you learn Japanese? I study to be a translator, and I am writing a report on non-professional translation and subtitling. Would you let me interview you? Even if you’re not interested, thank you for what you’re doing, keep up the amazing work! Oh sure, I don’t mind, though I don’t know how much I can help. You can email me at cosmos @ cadet-nine.org, or just use this comment thread, whichever is easier. I’m from the USA, took Japanese for a year in college, then studied abroad for a year in Tokyo, then took another semester of Japanese back in college. Let me know if you have any other questions; I’ll do my best to answer! I remember seeing a post floating about your translations on tumblr back when the anime was airing/finishing up and I never really did got around to reading it until now and honestly – thank you so much for all your time!! i’m only about a hundred pages in but the novel is just amazing so far & really !! thank you so much again!! Does someone are still on this project or it was abort ? There is still a problem with epub release. Chapter IV part 2 repeats itself twice. I tried it on pc this time to confirm. The duplicate part starts is at the middle of part IV chapter 2. Chapter 2 is basically written twice, but it looks like its all one chapter. Here is a picture describing where exactly the first instance ends and second one begins all over. It’s not that much of a problem since you can just skip to chapter 3, but it’s still kinda confusing. actually, I gave it a whirl just now, and it *should* be okay. test it out and let me know! Is part 5 still uncomplete?? Thank you for all the hard work!! Amazing job mate and amazing novel. It should be officially translated to a lot of languages due to its quality. Is there another link to the original Japanese on .pdf? The page says that the domain name no longer exists. First off , thanks for translating the novel. I choose my sources of entertainment very carefully so that they fit my specific desires. I wanted to watch some anime and chose shinsekai no yori after reading through some top 10 lists on the web. After the 3rd episode something about the story drew me in and upon learning the anime was an adaptation from a novel I stopped watching the anime and searched for a translation of the novel online which led me here. Anyway I finished part I and in the pdf p. 73-74 “The thing definitely resembled and minoshiro at first glance” perhaps the “and” should be replaced by “a”? bloody good read, books are the least effective form of entertainment for me, yet reading this gave me the most excitment I had for a while. Thank you for your hardwork, your courage of putting it out on the web, your generosity for sharing it to the whole world of English speakers. Um, I also have another question. how can a person like me support you? the same effect.” as the person kissing was saki, wouldn’t it be a “princess’s kiss”? I also caught some awkward sentence structures every once in a while but as English is not my native language plus I dunno the Japanese original context there wasn’t much I could do. It has been a very comfortable read for me, usually when I read English books I pause frequently to look up vocab. You translated the novel with simple yet fitting words, I’m curious was the novel in Japanese also written in easy to understand words or it was a choice of yours to make it easy to read when you translated the text? “So the prince didn’t wake from the princess’s kiss, but from the lingering aroma of food.” also at part II page 81. Here the prince is Satoru I think, as he is the one waking up, therfore the princess must be Saki. But Saki was just referred to as the prince earlier (thanks for your clarification “Although this wasn’t a prince’s kiss, it seemed to have the same effect.”) so the sudden role reversal confused me. you must think I’m awfully nit-picky but as this is the “way” to support you I can only tread forward whenever I find any little “imbalances” in the novel and present it to you. “Squonk shared some of our dried meat.” Part IV p.44 The scenario suggests that most of the food came from Mamoru, assuming Squonk has no food himself it would be weird to “share” something he doesn’t own. I’m thinking perhpas the group shared some of their dried meat with Squonk which may make more sense. Don’t worry about being nitpicky! This one is kind of stumping me though. Because to me, the sentence I wrote means exactly what you think it should be corrected to (that the meat belongs to Mamoru, and he’s sharing it with Squonk), since it says “our dried meat”, where “our” refers to the kids, and Squonk is taking a share of it. “Squonk shared some of our dried meat” the image I had initially (with doubt) was that Squonk took the bag of Mamoru’s dried meat and walked around the room handing out the dried meat to the humans. Part V p. 87-88 “The two thousand or so who still lived were in a state of panic that bordered dangerously on becoming mass mayhem” perhaps becoming “victims” of mass mayhem? I guess it could also mean that from the panic the living ppl became karma fiends and became literally mayhem themselves by killing all life around them, could that be it? Ah, I feel bad making suggestions about your work. I know nothing about the hardships of translating foreign texts (which I imagine is quite tough) yet here I am spouting little things……. Thanks, anyone who worked on these. He will probably upload the rest of the novel when he finish translating it. Just dropping by to say that there are still people who are constantly reading the translation. I really appreciate all the effort you’ve put into translating this masterpiece and can’t thank you enough. Part V .PDF release when fellow S.T.A.L.K.E.R.? I don’t mean to rush you or anything, because I really appreciate the work you’re doing here. However, is it possible for you to tell us when you plan on releasing updated PDFs? Oh. Yeah, that makes sense. Thank you for translating this. The anime was really good. My best A-1 Pictures to date. hank you for this translations man, the entire world should read this book, it explores so much of human nature and does it in such a brutal manner, truly a masterpiece. this is just too perfect. rest of the world are waiting for your final PDF. thank you for your hard efforts!! Do you plan on doing any more translations after you’ve finished Shinsekai Yori? If so, but have nothing in mind would you consider Jinrui wa Suitai Shimashita by Tanaka Romio? The novel is currently complete at 9 volumes. As far as I’m aware, the only attempt to translate the novel into English ended or was put on hiatus extremely prematurely. Also, unlike Shinsekai Yori, it did not receive a complete anime adaptation. If you have not heard of it, please watch, read, or through some other means decide if it is worth your attention. That aside, I am sincerely grateful for your translation of Shinsekai Yori, eerabbit. I hope your travels are pleasant and happy holidays. I had downloaded that translation and lined it up for a read right after I finished Shinsekai Yori: I’m secretly relieved it’s only 188 pages. It’s good to know that you’ll help with working on improvements. Out of interest, how did you come to learn Japanese? I’m interested in maybe taking courses in it while still in college, but there are reasons I shouldn’t. Just out of interest, I suppose. I have a whole list of languages I want to learn, but Japanese is the only one I’ve actually taken classes in. I definitely think it’s easier to learn in school, if you have time for it. I bought 四畳半神話体系 (with the new beautiful dustcover which has the anime illustration) but I need to know a lot more of kanji to read it T__T. You are the real MVP! Thank you for the translation! Thanks so much for doing this! I can’t wait to read this once it’s done. Will there be a completed version for kindle once you have finished translating it all? How are things going so far ? Are you still on it? i’m still updating part vi every other day. You are doing a great job man. Just wanted to ask a few questions. Is part 6 the last part? And how many chapters does it have? its been a long time since i followed your site, its a work of love and dedication, thank you for your hard work! Btw just one little question, when will you release the full PDF version? If you send me a html or xml copy of the 6 parts, I’ll make a clean (non-calibre) epub version. From there, any other format will be east cake. How is that epub coming along? I don’t if you’ve already received files from someone else, but if it’s necessary, I could collect the text of all the chapters in the book onto individual files (I mean, onto Word files and then convert those to html), and then email them to you for making the epub. It would take a week or so because I’m a bit busy right now, but I’d be willing to do it. Although, you have to let me know if anyone else gave them (or is going to give them) to you. Thank you for this translation. I’ve been waiting for its completion for a long time now. When will you post the final pdf? You could try to contact regular publishing companies, I mean the ones that publish translations or are open to various sci-fi fantasy types of novels. But if none of them want/trust your translation and you’re determined to get it officially published somehow, you could always use a self-publishing platform. 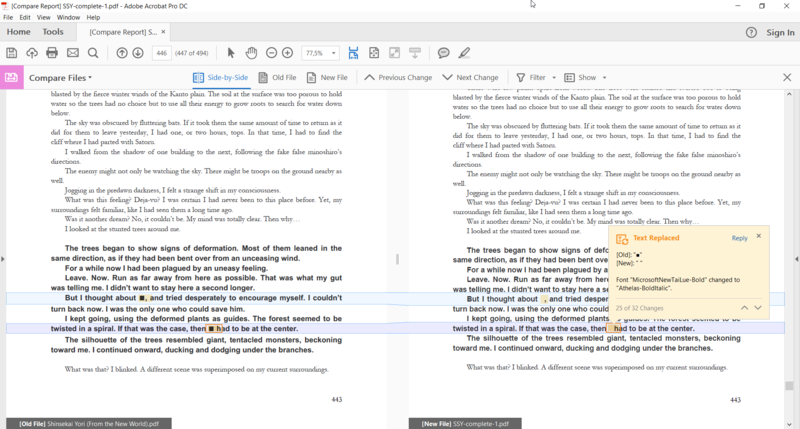 For example, there’s Smashwords, where you can publish your book just as an ebook (it could be a combination of epub, mobi, and azw3). P.S., of course, you’d have to contact the author first, since you need his permission to make an official publication and he might even want a percentage of the money you’d make off of the sales. Woooo thanks for translating this amazing masterpiece. It might be a difference in the way Japanese linguistically handles the concept, though I wouldn’t know, but in English, this should almost certainly be “…increases its entropy…,” not “decreases.” Decreasing the sun’s entropy would be akin to giving energy to the sun, rather than taking it away, so that doesn’t work with the rest of what Satoru is saying. As I understand it, the sun is like a huge fiery ball of entropy and every joule of energy that leaves the sun decreases its entropy by some small amount over time. So decreasing its entropy and taking away its energy go hand in hand. Oops, you are correct. Ignore my previous comment. Apparently It’s been a while since physics. I had to look up the formula again, since entropy is one of those overloaded terms with too many different contextual uses. Thanks! I suppose the entropy of the sun itself may decrease but the total entropy increases due to the emission of the light. It’s a kind of strange way to put it, but I think it’s ultimately technically correct. I think for the term to make the most sense, ‘entropy’ should be replaced with ‘enthalpy’, because stealing the sun’s energy would decrease its enthalpy, not necissarily its entropy. Is anyone currently making an epub of the complete novel? I am seriously about to go through the (long and tedious) process of collecting all the text and making one myself right now. About the Epubs: Jan’s version is pretty good because the chapters are marked (unlike in mine, where only the parts are marked), but actually he accidentally left out the text of the footnotes. I guess the footnote text is easy to miss when you’re just copying because it’s a lighter grey. Anyone who is working on improving the epubs at the moment, I encourage you to use mine. All that needs to be done with it is marking the chapters and maybe fixing the text style and linking the endnotes. Or you could just wait until Eerabbit is done editing Part VI and create one from scratch yourself. Actually, I’m going to update the epub to mark the chapters – but that’s all I’m going to do. If anyone wants to fix it up from there, go ahead. 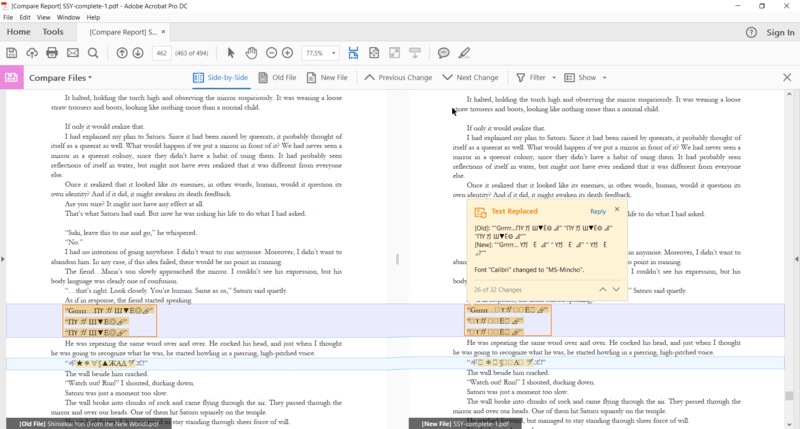 Also, for anyone who wants to work with it, you can get the original Word file (on which I collected all the novel’s text) from Eerabbit by email. Okay, I sent Eerabbit my updated epub file, as well as azw3 and mobi files converted from that. I’m sure they’ll be uploaded sometime soon. Notes: Apparently I missed a couple of chapter headings in the text, so that’s now fixed. Also, btw, all of the conversions and editing was done using Calibre, in case anyone wants to know. 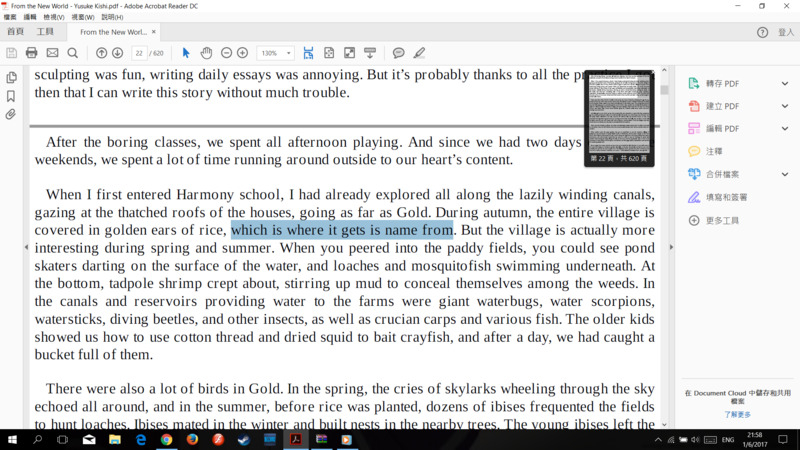 If anyone wants to create a new epub using my text, ask Eerabbit for the updated Word file I sent via email. Really appreciate your work man, Have been following your project since the beginneng, what are you going to do? Will you doing next project? Please kindly let us know! hiya, sorry for the super late reply! I’m working on editing a translation of the Tatami Galaxy with some other people but we’ve decided not to make it public until it’s done–no ETA though. Congratulations on finishing! Your work is much appreciated. Thank you for the pdf, and thank you again for the translation ! Alright, everyone, the updated version of my epub is up now, along with conversions to mobi, azw3, and pdf. This as far as I’m going with the ebook formatting. I did create the epub using Calibre, so some might say it’s not ideal. 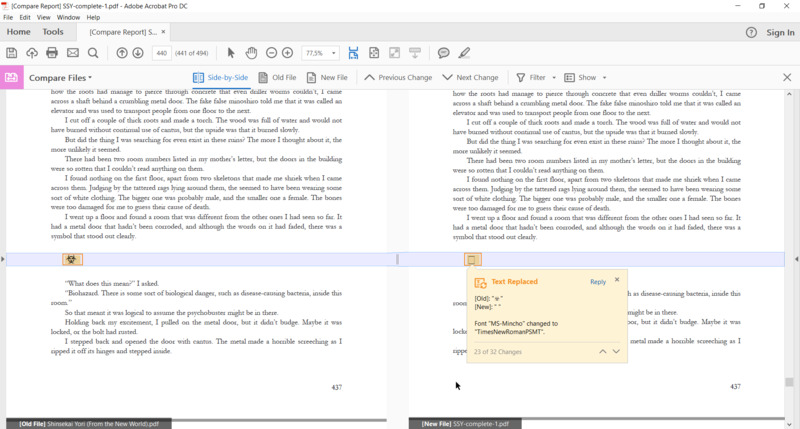 As I mentioned before, if you want to make your own epub, I did send the Word file with all the text to Eerabbit through email, so you can go ahead and use that rather than having to copy it all over again. Thank you so much for this amazing work! I fell in love with the anime version of the story and had to read it in prose and you made my dream come true! Thank you! Thanks so much for your dedicated translation and hard work! I’m so happy that you finished translating the novel. I ended up reading the whole thing in one sitting, and it added greatly to the world of SSY after I watched the anime. Again, thanks for your hard work and great job! This is one of the best translations that I have read. Thanks a lot for your effort! Thank you, thank you so much for this translation and all your effort!! I have a question. The link with the PDF only has about 420 pages, and the PDF version in the link with various formats has about 620. Is it just the notes, or is the 620 one more complete? I only looked through a few parts of her PDF completely, but it appears complete. It probably has less pages because the font size is smaller, despite having the same amount of text. Or rather, smaller font size and less spacing. Thank you so much for translating this book! Hey! Thanks a mount for the translation! I just came up with an idea – Why won’t you put somewhere nr. of your credit card so that people could donate you thanking for the job? Thank you so much for this amazing work :D. To tell you the truth, I waited for the translation to be finished to start reading it (I was veeery patient). Several years ago I didn’t even imagine this wonderful result. Thanks again, and congratulations, I’m astonished for the constant effort you put into it for sooo long :). Page 8: “…Loneliness became is only companion and confidant.”. Shouldn’t it be “his” instead of “is”? Page 43: “Oh yeah! So then at he very end,…”. I think it should be “at the”. Page 185: “…they would know that he had his ignored orders and helped us.” This sentence sounds weird to me. I would’ve expected “had his orders ignored” or “had ignored his orders”. Page 222: “…Even if they think they think they can control …” Well, in my language we rarely say something like that. I think there is an extra “they think”. Page 306: “…The sun’s lifetime is supposed to be around five hundred thousand years…” I don’t know what the author wrote, but I think you should check the translation of that number, since the actual estimated sun’s lifetime is around 5 billion years. Page 335: “…The must have somehow found out…”. I think it’s “They” instead of “The”. Page 470: “…Satoru took of his clothes…”. I think it is “took off”. Page 475-476: I don’t know if I missed something, but the name “Squeaker” was mentioned twice, is this guy Squealer? Page 480: “…began to emerge The last to come was the queen…”. I think there is a missing punctuation mark between “emerge” and “The”. Finally, I’ve recommended this translation to a lot of friends. I hope they can enjoy it as I did :D.
hiya, sorry for the super late reply. thanks for pointing these out; I’ll have them fixed in the new PDF! The anime had a lot of good content but I think it’s a poor man’s crossover from the original novel, so I wanted to buy this but it was sold nowhere. どもありがとうございました！I can’t imagine the hours of work you put into this, and I wanted to take a moment and let you know it’s greatly appreciated. It’s a small thing compared to all your hard work, but, again, thank you! Hi, thank you very much for the translation! I’ve been waiting to find the translated version of this novel and what you did is an amazing work! I watched the anime few years ago and still have the urge to understand more about the story and the issue raised in this anime and when I found your translation, I couldn’t be more happy! I really appreciate your hardwork! English is not my first language so forgive me for any mistake in my writing. I’m from Indonesia and I’m interested to translate your work into Indonesian language in order to practice my English. I hope that’s okay for you! So, If I ever done the Indonesian version, would you mind upload it in this website so people that looking for Indonesia’s version can find it easily? Again, thank you! hi, sorry for the super late reply. Of course you can translate it, and I’ll be happy to put a link up! Thank you so much for translation!!! Hope to see your next project if you have plans for it!! Hopefully he decides to pick up Shinsekai Zero Nen, the prequel. Really? And he will post the translation here or in a new site? I really loved reading this!! Will you also translate the prequel that is being published in Shousetsu Gendai, Shinsekai Zero-nen?? Thankyou for all your hard work! Just finished the anime yesterday. This is so valuable to me. I tried searching for the complete novel on Amazon but to no avail. Thank you so much for this wonderful upload. But where can I buy the book? Is it true that you will translate Shinsekai Zero Nen? And if yes, you will post it here or in a new site? Thank you so much for putting this much work into this book. I saw the anime, loved it, and as soon as I discovered it was based on a novel I had to go looking for it. I wish there was a way to get hard copies as not everyone likes to read digitally, , but I am already beyond excited about sharing it with my non-anime friends who are willing to read online. Again, thank you so so much for making this available. I think your message may have been cut short. 1. Rabbit hasn’t responded to anyone in a couple months. He/she’s probably busy with college/work. Rabbit started this back in 2012 if I’m not mistaken, so you probably won’t get an answer. 2. I’d assume as long as you don’t claim it’s your own work, you can use the translation. Give credit where credit is due. 3. Are you translating it into spanish? If so then it would be your “original” work anyway. Thanks so much for the great work. There were almost no errors, the translation was smooth, and I never noticed a lack of transmission of the author’s ideas. That is really impressive. I originally downloaded this back in June and it’s taken me all the way until now to finish it. Such a beautiful novel and the imagination of the author…. Reading the comments above, it seems like there is a new prequel novel. I guess I can say that I am actually not too happy to hear that because now I’ll worry about when I can finally read it. Either way, thanks for your great translation work over the 3-4 years and clever imagination. I know that literal translations and actually conveying the author’s message is difficult to do, especially with kanji. There were so many life lessons, emotional scenes, and scary moments in the novel that it reminded me of a series I loved when I was a kid called “The Night Angel trilogy”. I think there are some similarities between the two. I can’t thank you enough for this ! Thank you for all your hard work and for letting us read Shinsekai Yori, and for everything. Thank you so much for this translation and all your hard work! Can anyone explain the words that are used for ‘Emperor of Eternal Delight’ and how they are pronounced in Japanese? I’m trying to understand the anime a bit better and I’m at a loss. The individual words don’t translate to anything that I thought I heard there. He says something like “daikanketetoareena”. Perhaps ‘kanke’ is ‘delight’ and ‘teto’ is meant to be ‘tenno’ (emperor) even though he definitely says it with a ‘t’. I don’t know how it all fits together or where the ‘eternal’ comes in. Is ‘dai’ here a particle? hiya, sorry for the late reply. do you remember which episode this was in? It should be “Dai Kangi Tei”. Dai means big, great, or in this context, “eternal”. I think this translation is very smart. What you listened like “toareena” might have been “to iwareta”. It means “he was called”. It follows a noun contrary to English. I was looking for this book a lot time and I could not find it yet. But today became in the best day of the year. (Probably I will read it when i’ll speak better, but i’m completely happy for now, thank you again). Just finished reading your translation – terrific work! I found a couple of minor typos which I’ve listed below. I don’t have page numbers for them since I just took them down as I went along, but a regular search should find the pages easily. Hey, i’ve been reading this novel a few years ago, but back then it was not fully translated. To be honest, i’ve never thought that i will come back to this, thank you! Could you give me the permission to translate your English translation into Vietnamese? It will be nonprofit and only for fan. Thank you. Since you’re recommending to buy the book, and since I want to do so..
Could you leave out some source? I’ve been going through eBay, Amazon and such.. But I’m having a hard time ascertaining whether the book I find is the single volume edition release of the book, or not.. I aim to acquire the single volume release.. For example.. That’s just a single something.. I think it’d be great if you’d somehow post a guideline for as to how to buy the book. I’m afraid I don’t know where to find the single-volume version. Something that might help is if it has any of these characters 上，中，下 on the front, then it’s definitely not a single-volume. Though I’d still ask the seller to be sure. Sorry, wish I could be more help! gaaah I thought I fixed this one! Next time, for sure. I’m suppose he’s sleeping somewhere deep in the ocean of my subconscious. -> I suppose he´s sleeping somewhere deep in the ocean of my subconscious. thank’s for the update and Happy new year ! Thank you very much for this! I just finished the anime and I’m craving more details. Thank you so much! Finally I found the complete translation of this book. How was the way you used to make this site? Asking because I can’t find any place to make a site like yours, and I want one to put my translations as well. I Looked at Wikipedia and I read about 7 volumes. This translation comprehends all volumes? There are actually only 6 parts; the publishers put out 1, 2 and 3-volume versions, which is kind of confusing. But this translation has the whole story! Even though it’s a ‘non-professional’ fan translation, it’s written better than most books that pass under my nose – and I read about 2-3 novels a month, for years now. You should take great pride in this endeavor you’ve undertaken! Here don’t you mean “that leads to the courtyard”? would it be “which is where it gets its name from”? Heya, much thanks for translating this! However, I do have a question. Out of the PDF, epub, and online version, which one is the most recent updated one, preferably with footnotes? Thank you! thank you for all your hardwork.. The other changes made were small corrections: woman -> women and I’m -> I. Could you publish your email, so we can talk? Hey fjnm018, what is 新世界ゼロ年? New World Zero Year? I can’t find any information on it. Sorry this reply is ages late! I totally forgot about Zero-nen to be honest. I’ll go search around for it soon, but no promises yet! Any news about the prequel yet? I’m extremely excited for a possible translation of it, but the only thing I could even find was this link (http://shousetsu-gendai.kodansha.co.jp/latest/201411.html) that I can’t even read. Also, thanks for translating Shinsekai Yori. I just finished the novel after watching the anime a few years ago, and the translation was pretty much perfect. Hey ! I’m reading your work and i’m Very grateful for it ! I was wondering if someone have already translate it to french ? Thank you very much for all of your effort in this translation! I’m Japanese, and a big fan of the original novel. Since I’m learning to improve my English, I had been looking for an English translation of it. I just started reading. I’ll leave comments later if I find something I can help you. Though I’ve only read a few chapters, I felt that this translation is beautiful and reflecting the author’s idea very precisely. I cannot imagine the difficulty so again, thank you very much. The former part is not saying about what she said, but about the feeling she had when she posed the following question to Satoru. *Sorry for my non-native English. Actually, Saki felt ridiculous not about Maria but about what Satoru was talking about. What was “uncertain” about for Saki was whether “It’s one of our oldest festivals, with over two thousand years of history.”, not about the other name of the festival. The subject of being a bad influence is mother’s worrying behavior. It was not the priest’s opinion but the opinion of an insomniac. He (or she) asked the priest to tell a story not to sleep, but to learn something good for his life from it. Then (maybe on another day), upon this offer, the priest gave a sermon for a bunch of insomniacs. As a result, they easily fell asleep. Actually Maria did not turn Saki’s head to face her in this sentence. It was like hugging Saki from behind. Sorry I found my error. It might seem like negative sentence, but it is a kind of tag question. “We” is apparently Saki and Satoru. I assume it came from the confusing word “cushion”, but in this Japanese context it does not actually mean “a cushion”. In Japanese, “cushion” sometimes means just an object of mediation. In this context, it means mediation of cantus. Sorry for my poor expressions. I really do respect those cool translations of yours. Please consider my comments as just a reference for you from the perspective of a Japanese native. >If we could keep this up for a little longer, they will have wasted almost two whole minutes. It might seem they did not waste almost two whole minutes, but actually they did. The meaning of “longer” here is longer than what she had described. In other words, she just did not remember the whole conversation. >and had just agreed on a starting point (isn’t that enough already? ), when Satoru started telling one of his tall tales as an example. >A bunch of objections came to mind, but I kept quiet. If I said anything, it would mean that I was accepting his ridiculous story. Actually Saki was too confused to say anything because she felt what Satoru said was completely nonsense. >Who knows what he was saying out of desperation. We all turned to look at him. It might seem the first line was Satoru’s but it was spoken by Shun. The 2nd line was Saki’s. Both were speaking to Satoru. Since Satoru was already aware at this point that the eggs were born by a haythatcher, I would suggest that it should be “the haythatcher” instead of “the bird”. >But I never knew it used the Devil’s Hand as a defense against rat snakes and rosary snakes until today. I think using the Devil’s Hand should rather be for offensive purpose for haythatchers because it is not for protecting their actual eggs, but for killing the other snakes. >but I seem to remember feeling slightly uncomfortable at that time. It was a real-life example of the adaptation and natural selection mentioned in the textbook. In order to survive, even something like the Devil’s Hand could be evolved. Saki was questioning whether this Devil’s Hand has been evolved “naturally”. >“Yeah, but it’s a river, so there will always be some waves. Really appreciate what you have done. I am a big fan of From the New World from China and I had read the Chinese version From the New World twice. Admire your work! Just wanna express my love for you. Watching the anime now and was curious about the book. Thanks so much for the translation! I was a few years late on this anime, but I finally caught up and finished it just last night. I wanted to preserve the sentiments and emotions that were evoked lol therefore I’ve been visiting forums and soaking in everyone’s thoughts and opinions about the whole series. I was then led here — to, apparently, the original novel that started this whole fiasco — which you undertook to translate so generously. Thank you for committing all your time, attention, work, resources, and crazy brain power to make this translation readily available for everyone. I wasn’t here to watch the slow progression of updates, so I’m lucky to be able to just read everything in one go lol ^_^ <3 But, time is very important. And I'm chiming in with a comment to appreciate the time that you spent on this. I read above that you were also juggling college and your degree — needless to say, I hope everything has worked out for the best for you! You are absolutely amazing for putting in all this work. The anime is one of my all-time favorites, and I am incredibly grateful for the opportunity to read the original work. A translation project of this size with no expectation of reward is astounding. Thank you so much for doing this. Would it be possible to upload this as a flat text file as well? That would make it possible for archival services to archive it in case it ever goes down. Thank you so much for translating the book, really admire your work. Have you looked into translating Shiki (the novel)? As far as I understand, it is published monthly? Do you have any plans on picking it up for translation? Many of us would be over the moon with happiness and excitement!! Hey, thank you so much for sharing this story with us! I was so delighted to discover that this translation existed. I loved it and I’m grateful for your hard work. This is merely a fan translation and is not affiliated with or endorsed by the author or his publisher.